Most of today’s modern cellular installations interconnect baseband unit (BBU) and far-end remote radio heads (RRHs) with fibre-optic cables. This new network configuration, known as fronthaul, provides many advantages. RRHs can now be physically separated from BBUs. The BBUs can be kilometres away at more convenient locations, such as in a centralised radio access network (C-RAN) architecture. Moreover, with a remote radio system, the RF power amplifier is installed in the tower-mounted RRU and cooled by ambient air flow. This decreases or removes the need for active cooling in the base station and improves energy efficiency. However, with this new cellular installation, analog RF signals can only be accessed at RRHs, which are often placed in hard-to-reach locations, such as tower tops or rooftops. Field technicians are therefore required to climb these places in order to measure and troubleshoot RF interference issues. The end result is increased operational expenses and added safety concerns. To meet these challenges, Exfo’s OpticalRF application allows mobile network operators to quickly and easily locate all RF interference issues in fibre-based mobile networks using real-time, high-resolution RF spectrum analysis over CPRI (common public radio interface). 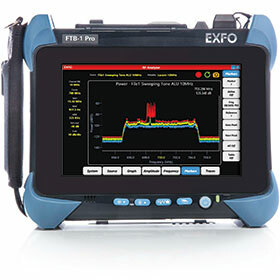 Exfo has made its OpticalRF application available on the FTB-1 Pro test platform, allowing mobile network operators to quickly and easily locate all RF interference issues in fibre-based mobile networks using real-time, high-resolution RF spectrum analysis over CPRI (common public radio interface). 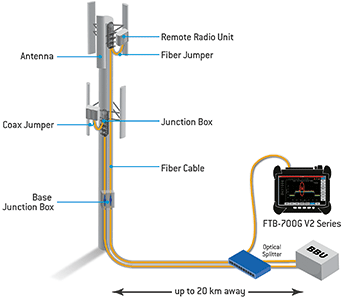 Supported on the compact and powerful FTB-1 Pro platform, the new OpticalRF appli-cation reduces the costs of turning up and troubleshooting mobile networks by providing access to the RF signal through the digital CPRI link available at the base station, located at the bottom of the cell tower or sometimes kilometres away as in a centralised radio access network (C-RAN) architecture. This in turn eliminates unnecessary tower climbs and significantly reduces maintenance costs. In addition, Exfo’s solution accelerates time to resolution of complex RF issues by enabling multiple users to connect, control and collab-orate via remote access from any smart device or laptop directly to the OpticalRF application. This enables cell technicians to quickly and accurately identify critical interference issues such as external RF interference, and internal and external passive intermodulation (PIM). This innovation brings RF spectrum analysis over CPRI to Exfo’s all-in-one FTB-700G V2 Series, which is housed in the FTB-1 Pro platform and integrates Ethernet service validation, connector end face inspection, fibre characterisation with iOLM and CPRI link validation in a single unit. The hardware platform is ready for CPRI rate option 9 (12,1 Gbps). With OpticalRF, recorded I/Q data provides complete information for comprehensive analysis before or after an event, and it saves several seconds of I/Q data depending on the CPRI data rate. Record triggers, such as limit line violations, can be set up.